"Producing a record album is a very complex affair," says the liner essay. It lists all the tasks involved, including producing a photograph. And, no offense to the Heart Warming label, but it looks like they saved money in that department. Put the group in a dark room, have them say "cheese," snap shutter, print whatever shows up--not a big bite out of the budget, I'm guessing. But do we buy these for brilliantly designed jackets? No. 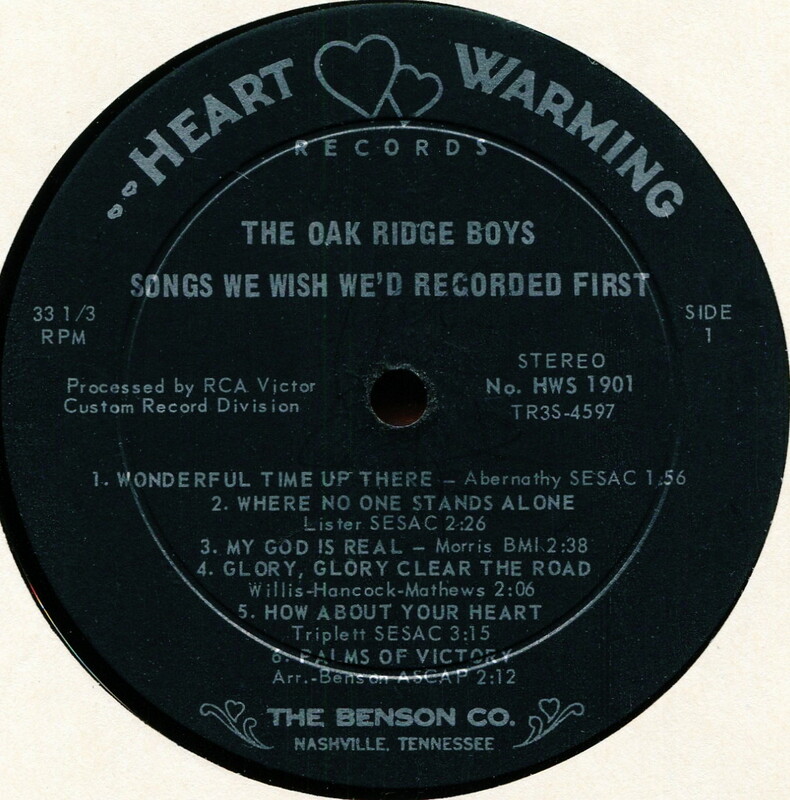 Btw, for some reason, in the track labeling, I typed the label as "Heartwarming." No biggie, but.... I see I at least got the "HWS" part right. I was afraid I'd mistyped it as "HMS." You know, recorded at Harvard Medical School. I am not fully with it tonight. The Oak Ridge Boys, luckily, are fully with it on these 1966 tracks. 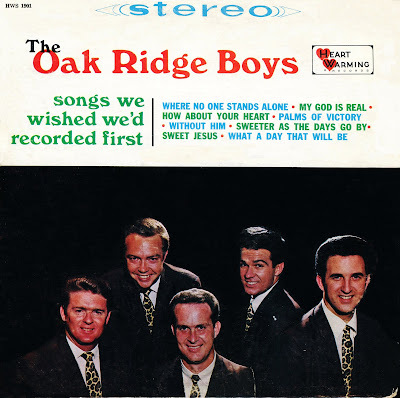 I bought this 99-cent Goodwill special because of Palms of Victory (also known as Deliverance Will Come), and I just knew the Oak Ridge Boys would do a memorable version of that number, of my all-time favorites. And I was correct--this version is terrific. The song is from 1836, and the musical phrase that sounds like Oh! Susanna was no steal--it predates Foster's tune by twelve years. And I'm getting major deju vu here--I must have featured this song in a recent post and made the same comment. 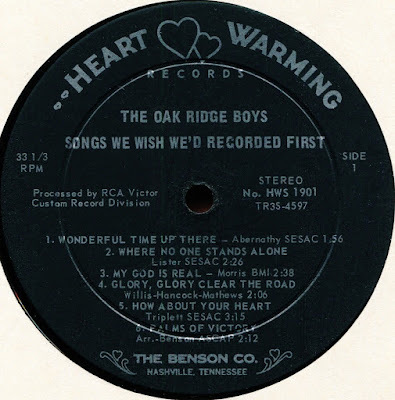 Anyway, kind of weird to put an 1836 number on an LP of songs the Oak Ridge Boys wished they'd recorded first. Smith's Sacred Singers recorded it in 1928, but that's a mite bit ahead of the ORB, which was founded in the 1940s, says Wikipedia. But I ask too many questions. We're hear to listen to some excellent gospel quartet sides. Faith Unlocks the Door was a favorite of the pastor and her husband at my previous church, and they sang it as a duet. I think I accompanied them--not sure. But I must have, because I have a photocopy of the music, and it could only have come from them. 1955 was the year of composition. Great to see a Doris Akers number on here (Sweet Jesus). I was going to upload to Box, but forgot, so sorry about the return to Zippy. Where did they get those 60s paisley neckties...kind of loud for a gospel group back then. I look forward to giving this a listen later. All these are familiar tunes from listening to my grandparents and their gospel group when I was a lad. Thanks, Lee - this looks like a good one! Perhaps the best album title I've ever seen!